The National Association of Tower Erectors (NATE) today announced the member companies who have been formally approved to participate in the prestigious STAR Initiative program for the 2015-2016 year. The Association made the announcement at the 2015 Competitive Carriers Association (CCA) Annual Convention in Fort Lauderdale, Fla.
“We are thrilled with both the quantity and caliber of companies who have been accepted into the STAR Initiative program this year,” said NATE Operations Manager Shelly Trego. “STAR Initiative participants represent the gold standard in the industry from a safety and quality perspective due to their commitments to demonstrate the highest levels of tower-site and worker safety within their respective companies,” added Trego. The NATE STAR Initiative is currently entering its fifth year and is the Association’s signature program designed to help companies operate safely and recognize tower contractors, owners and carriers who voluntarily adhere to higher safety standards. 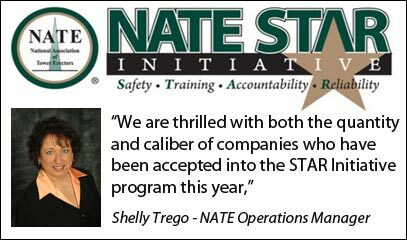 The NATE STAR Initiative emphasizes Safety, Training, Accountability and Reliability by requiring participants to commit to requisite levels of training, site safety audits and the implementation of safety programs while adhering to industry best practices. STAR Initiative participants also receive discounts on designated training courses offered on the NATE EXCHANGE, a dynamic website platform connecting companies to training courses offered in the tower industry. This year, participating companies will also be able to utilize an exciting new STAR Initiative App designed to enhance their program experience and provide a convenient means of submitting Site Safety Audit documentation in real-time directly from the field via smart phone, tablet computer or other mobile devices. The official NATE STAR Initiative App is available as a free download in both iOS (Apple) and Android platforms. “On behalf of NATE, I commend the companies who are active participants in the 2015-2016 STAR Initiative program,” stated NATE Chairwoman Pat Cipov of Cipov Enterprises, Inc. in Sumter, South Carolina. “The participants involved with this premium program are placing their respective companies in a strong position with the wireless carriers, tower owner/vertical realtors, OEM’s and turnkey/contruction management firms as STAR Initiative participation is often utilized as a key requirement factor during the vetting process that leads to the hiring of contractors,” emphasized Cipov. 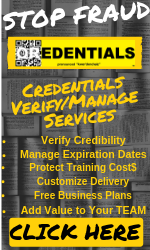 F – FDH – Velocitel, Inc.
G – Grapevine Solutions, Inc., GrayWolves Telecom, LLC, Great Plains Towers, Green Mountain Communications, Inc.
H – Hayden Tower Service, Inc., Heartland Solutions Corp., Herca Telecomm Service, Inc., Hightower Communications, Inc. I – Independent Network Services, LLC, Industrial Communications, LLC, Integrated Installations, Inc.
L – Launch 3 Telecom, Legacy Telecommunications, Inc., Long Wave Inc.
N – NDC Communications, LLC, Newkirk Electric Associates Inc, Nex-Tech Wireless, Nex-Tech, Inc. – Mobile Radio Div., Norris Tower Incorporated, North Sky Communications, Inc., Northeast Towers, Inc., Northern Pride Communications, Inc.
S – SAC Wireless LLC, SAI Communications, Sentenia Systems, Shenandoah Tower Service, Ltd., Show Me Welding, Site Resources, LLC, SiteMaster, Inc., Sky Climber Tower Solutions, Skyjack Communications, Smith Communications, Southern Tier Towers, LLC, Southern Tower Telecom, Spectrum Construction Services, Inc., Speelman Electric, Inc., STG Communication Services, Stout Tower Services, Structural Tower Services, Inc., Synergy Concepts, Inc.
T – Telcom Construction Wireless Division, Teltronic Towers, Inc., Tiller Engineering Inc., Tilson, Timberline Construction Corporation, Total Service Telecom, Inc., Total Telco Specialists, Inc., Tower & Turbine Technologies LLC, Tower 16, Inc., Tower Inspection, Inc., Tower Safety & Instruction, Tower Systems, Inc., Tower Technologies, LLC, TowerMRL, Inc., TPS Wiring Solutions, Inc., Tristate Tower, Inc.
U – US Tower Services, Inc.
Additional information about these companies can be found here.